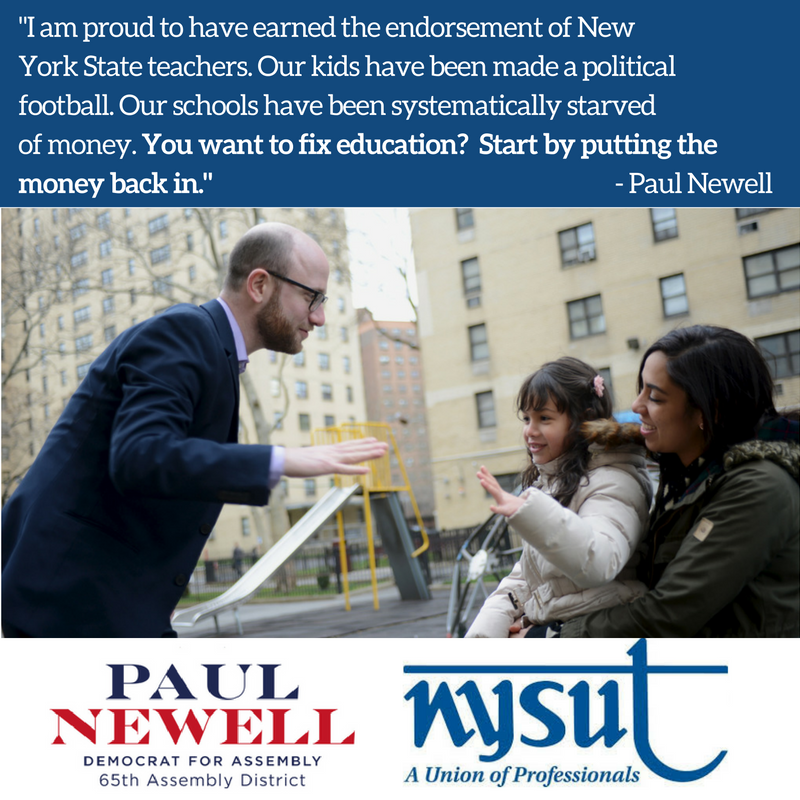 I am beyond humbled to have received the endorsement of New York State United Teachers and the United Federation of Teachers in our campaign for change in Lower Manhattan. Education has been under siege for way too long. This is one of those issues where there's a clear-cut right and wrong, and too many politicians have been doing the wrong thing for decades. Please join us over the next 17 days as we bring our campaign for quality schools to Lower Manhattan voters. Sign up to volunteer at http://www.newellnyc.org/volunteer, or come by our office at 260 East Broadway, Suite 2 anytime. Let's be clear: our entire democracy, the very possibility of equity, exists because of public education. To question the need to support classrooms, textbooks, and most importantly, teachers and students, with public funds, is to deprioritize one of the cornerstones of our society. And none of us should stand for that. I'm honored to be in the company of NYSUT and UFT, who have been fighting so hard for this basic necessity. Today, I'm visiting the Gouverneur Health back-to-school festival. I'm going to take the moment to talk to students, parents and the members of our school community, because their issues are present, real and urgent. And next year in the Assembly, we're going to put those issues on the front burner, for once.